If you’ve been told you need surgery for herniated, bulging, degenerative, or ruptured discs but are concerned about the risks, you are a potential candidate for decompression therapy. 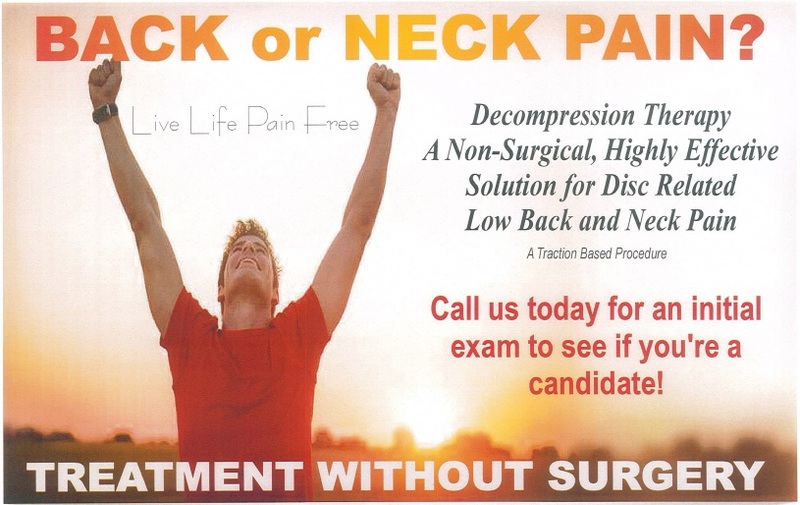 Decompression is a safe, non-surgical therapy developed to relieve the pain using traction. By cycling through distraction and relaxation phases of treatment, a spinal disc can be placed under negative pressure, causing a vacuum effect. This decompression allows bulging or herniated disc material to be drawn back within the disc. This increases oxygen and blood flow to the affected areas to promote healing, relieve pain, and speed up the recovery process. Decompression therapy reduces the pressure on spinal discs and facet joints through unloading created by distraction and positioning. Decompression therapy effectively enhances the healing process and often renders quick, effective pain relief that enables most patients to return to an active lifestyle. However, it is important to remember that decompression therapy will not address your subluxations. Therefore, therapy is most effective when combined with chiropractic adjustments. Your treatment plan will be customized for your individual condition and needs. The average treatment protocol ranges from one to three months (12-24 sessions) with individual session times lasting from 10-20 minutes in length.